The Casino des Palmiers in Hyeres is a strange building one end is rather nice (the one on the picture) and the other is mirrored glass panes that come all the way from the the 1980s (and really should go back there). I was over there some time ago and had taken three exposures of the building, somehow they just didn’t work out as an HDR and I couldn’t quite make the picture work. With a bit of editing based on some Lightroom 5 Tutorials by Serge Ramelli, I managed to get this out of it. Somehow it made me think of the Grand Budapest Hotel, maybe it’s just because of the colors being so strong. Not sure but that’s what I thought about. You can get the highres version here. 1. You can do more with the under-exposed image. With the latest version of Lightroom it’s actually possible to get some great stuff out of it. 2. Shoot as large as you can and crop it afterwards. But you’ll need a good resultion because you loose quite a lot of image size. Update: I changed the photo, looking at it on another screen I noticed that the earlier version lacked some sharpness. The new version is sharper and I prefer it. 09 Mar	This entry was published on March 9, 2014 at 10:30 pm. 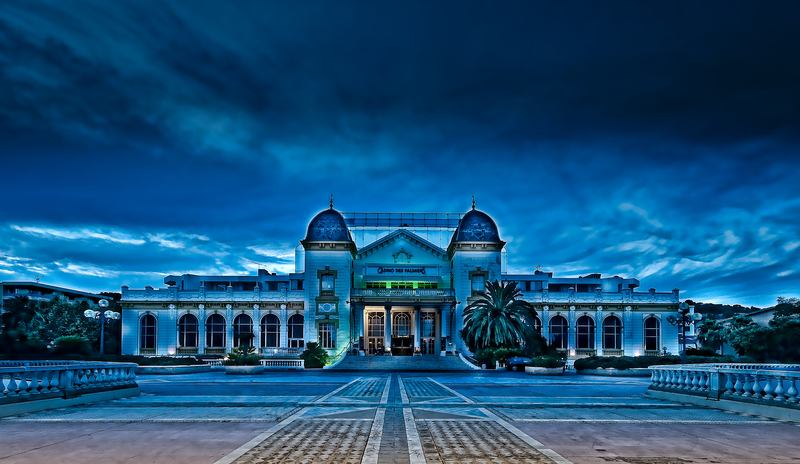 It’s filed under Buildings, HDR, Monument, night photo, Nikon D300, photography, summer, Sunset and tagged Building, Hyeres, night, photography, Sunset. Bookmark the permalink. Follow any comments here with the RSS feed for this post.